Report Minerva errors: "Page not working" / "Page can’t be displayed"
This form should be used to report issues related to the error messages "Page can't be displayed" or "Page not working", shown below. For all other Minerva issues please call the IT Service Desk at 514-398-3398. 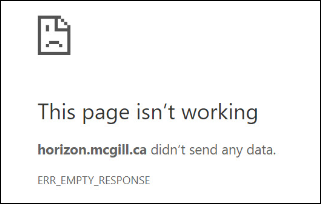 If you have a McGill Username and Password, you may log in to pre-populate the form fields related to your McGill account. NOTE: If you can provide a screenshot showing the error message, and the web address (URL) of the Minerva page, that would be extremely helpful for troubleshooting. If you have a McGill phone number, it will be auto-populated. Find out the IP address at https://www.ipchicken.com/ and enter the value here. Click here if you don't know your browser version.